My rendition of Xiphiacetus (Eurhinodelphis) bossi - The Long-Snouted Dolphin of the Calvert Cliffs. Name: Xiphiacetus is a Genus of Eurhinodelphid dolphin. It was originally called Eurhinodelphis. Taxonomy: Eurhinodelphids, like all dolphins, are Mammals. Xiphiacetus lived around 23 to 5 million years ago. Fossils of Xiphiacetus (Eurhinodelphis) are found throughout the world in Miocene marine sediments, from North America and Europe to Australia. Xiphiacetus is the most common toothed whale in the Calvert Formation. Xiphiacetus would have looked like a modern dolphin today... Except for the insanely long snout! Eurhinodelphids are an average sized dolphin. The long snout would have taken up almost 1/3 of its body size. Their teeth look similar to todays dolphins, small, conical, and peg-like. 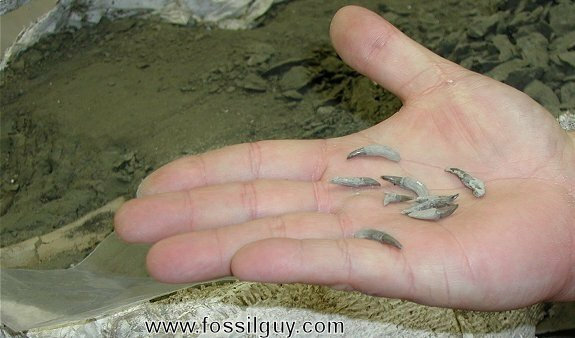 Since they have small, peg-like teeth, similar to todays dolphins, they would be well suited for eating small fish and squid. The extremely long snout may indicate they were specialized feeders, and may have batted at schools of fish with their snouts, like todays swordfish. The snouts on Eurhinodelphid dolphins are HUGE! Image of a Xiphiacetus jaw section and rib from a fossil specimen found in the Miocene Calvert Cliffs. The lower jaw is almost completely exposed here. Notice the length of the snout. Like all dolphins, Eurhinodelphids belong to the Odontocete Order, the toothed whales. Specifically, Eurhinodelphids belong to a Family of primitive dolphins called Rhabdosteidae, which was traditionally called Eurhinodelphinidae. Members from this Family can be found in Miocene deposits throughout the world including North and South America, Australia, and Europe, as they appeared to be very successful in the Miocene. This primitive dolphin family, ranging in size of 6 to 9 feet in length, is characterized by their incredibly long snouts. Although Eurhinodelphids were one of the more common dolphins in the Miocene, it is still a primitive dolphin quite unlike any living dolphin today. For starters, this dolphin still retained slightly complex teeth, which means the teeth are shaped differently depending on their tooth position in the dentition (similar to land mammals - we have molars, canines, and incisors). Although the teeth in this dolphin were only slightly complex, these teeth were still a vestige left over from their land origins before they returned to the sea long ago in the Paleocene. Paul of Chesapeake Heritage And Paleontology Tours holding some of the Xiphiacetus teeth found during the excavation. Today's toothed dolphins and whales have evolved simple teeth, they are all peg like and look identical, regardless of their position in the dolphins mouth. Although Eurhinodelphis teeth are complex, they are still tiny and peg shaped, as in the picture above. This means Eurhinodelphis' diet was similar to that of today's dolphins, mainly crustaceans and small fish. 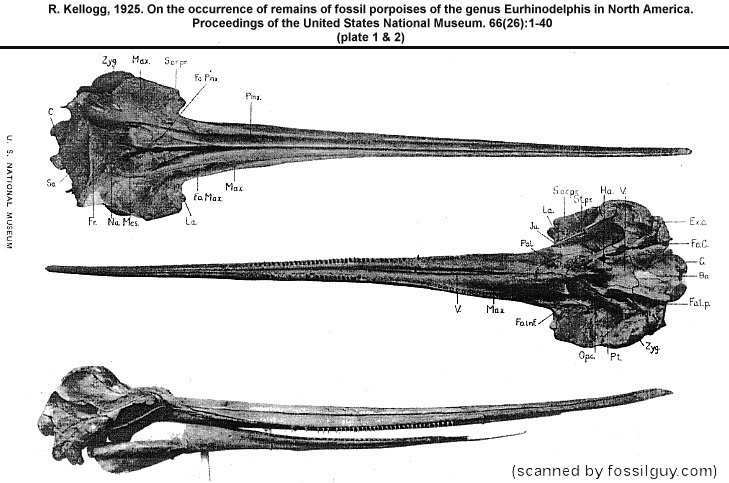 Also, due to Xiphiacetus extremely long snout, it looks quite unlike any of today's common dolphins. 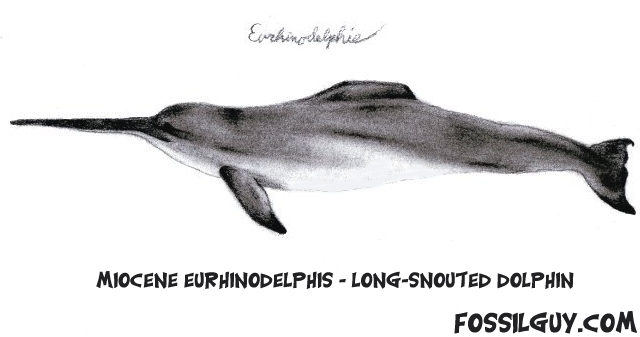 Although the long snout may superficially appear similar to today's River dolphins, Eurhinodelphis are not related. There is also a major difference in the long snouts: Eurhinodelphis has no teeth toward the front of the snout. It may have used the long toothless end of the snout to dig and sift through the sand, stirring up its hiding prey (a behavior that can be seen in dolphins today). Perhaps it may have used it's long snout to bat at schooling fish to stun them. Determining the use of this long snout lies in the realm of speculation, but it is interesting to ponder. At any rate, by the end of the Miocene, these strange looking Rhabdosteidae dolphins, which were as common as the dolphins one sees at a beach today, were becoming extinct. They were being replaced by the evolution of the modern dolphins, which are still with us today. Mchedlidze G.A. ; Translated by Chakravarthy, R. (1984). General Features of the Paleobiological Evolution of Cetacea. New Delhi: Oxonian Press. Translated for Smithsonian Institution Libraries. This is a great book for learning about whale evolution. It's the most up to date book (2014), and has all of the recent discoveries over the past decade. Hans Thewissen gives a firsthand account of the fossil discoveries, from their origins as small land dwelling mammals to modern whales. 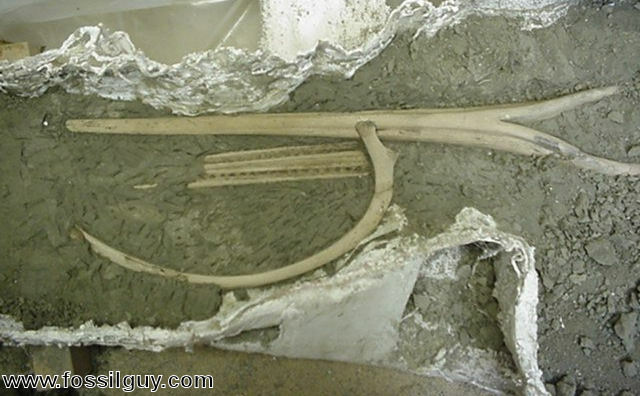 He is also one of the leading researchers in the field of whale paleontology. This is a great book for if you are interested in understanding whale evolution. Check it out. From Squalodons and Basilosaurus to Maiaicetus, this is it! A treatise on whale evolution complete with many of the new fossil discoveries and new genetic research! It covers the global cetacean fossil record, the move from land to sea, diversity in different time periods, evolutionary changes, and much much more! If you are crazy about the evolution of whales, you must have this! You can browse through the table of contents and select pages via the link. 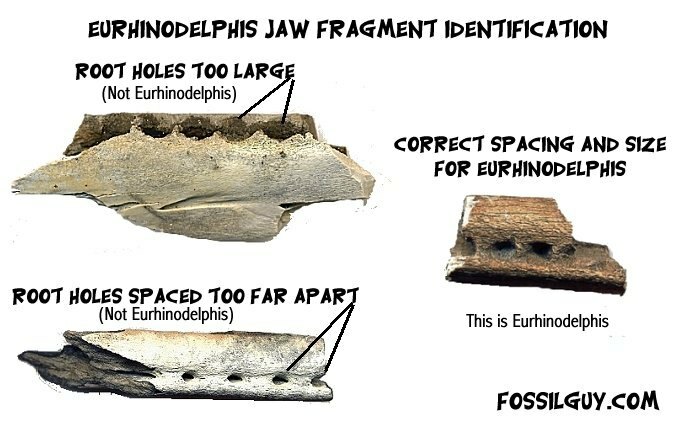 Unfortunately, Eurhinodelphid fossils look almost identical to the dozens of other small to medium dolphin fossils found in Miocene exposures. The most common Eurhinodelphid dolphin at the Calvert Cliffs is Xiphiacetus bossi. 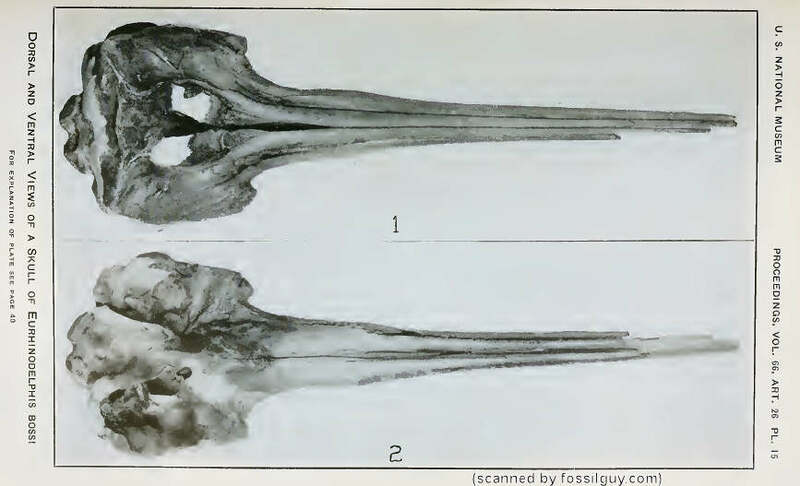 Unless there is a skull found, it is very difficult it not impossible to determine what type of dolphin isolated fossils come from. This includes vertebra and individual teeth. However, since Eurhinodelphids had an unmistakable long, slender snout, with small teeth spaced close together, jaw fragments can be identified. 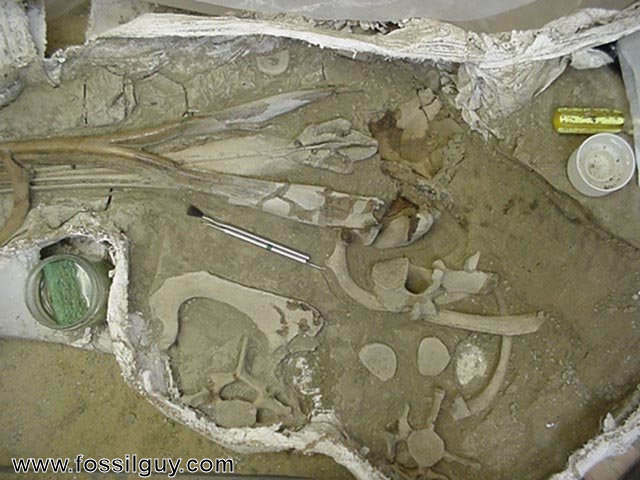 Image of jaw and skull sections, ribs, and vertebra of a Xiphiacetus Fossil. 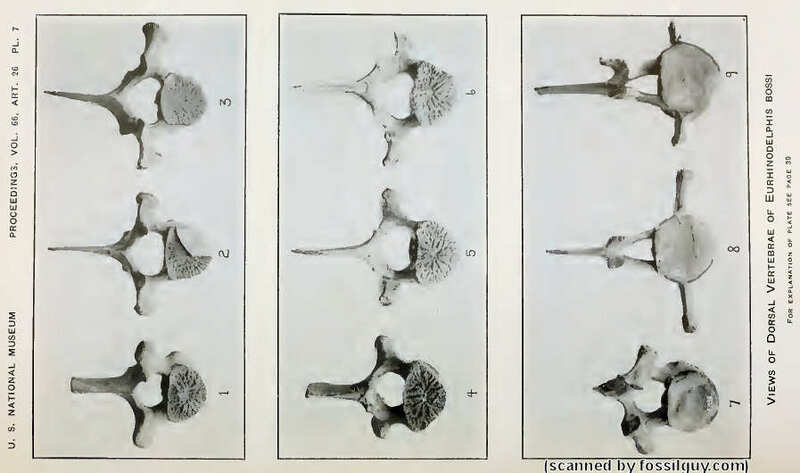 This is an image of a few random jaw fragments. Notice the Xiphiacetus jaw section is very narrow and has small, closely spaced root holes. 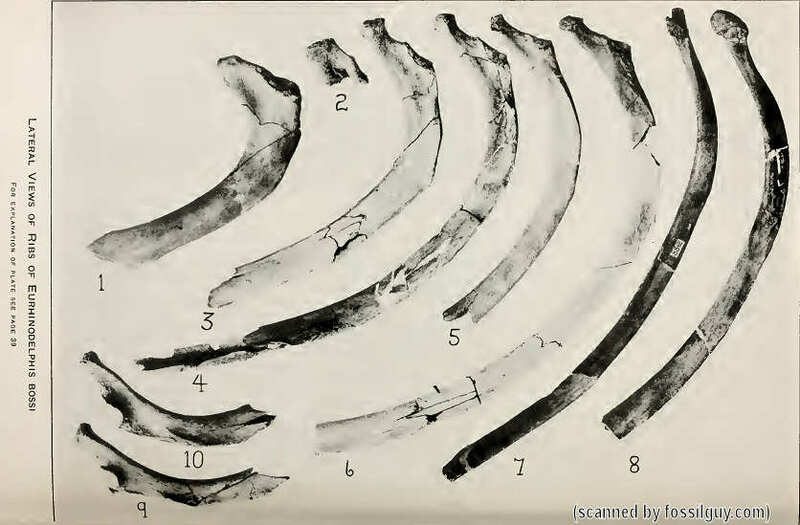 For more images of a Eurhinodelphis specimen, go to the Xiphiacetus Excavation Article. Kellogg, Remington. (1923). Description of two squalodonts recently discovered in the Calvert Cliffs, Maryland: and notes on the shark-toothed cetaceans. No. 2462 PP 1-69. April 24. This one has the end of the long snout broken off.